You’re only as good as the people you surround yourself with. We all need someone to share our toilet training mishaps, our first food fails, our in-law dramas, even our partner problems. 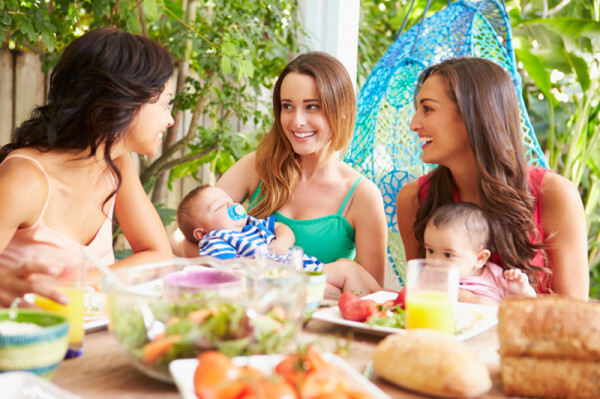 Regardless of whether you have a group of girlfriends or just a select few, we can guarantee that you have at least one of these awesome mummies in your crew. Some mums rule Pinterest. Others, like myself, do not. If Pinterest fails are part of your life then having a pinner mum on hand means when your daughter’s princess castle birthday cake ends up looking like an advertisement for an adult toy shop, you can call Pinterest mum to lend a hand with her Kitchen-Aid wizardry. What day is school picture day? When does soccer start? Who is singing at the next assembly? Call the informed mum. She has every event in her diary. You’ll never have to save another letter from the school again. The informed mum knows. And she is only a phone call away. Another great thing about your Gordon Ramsay mum is that whenever you are feeling down and head over for a cuppa, you can be assured she will have a delicious and decadent cake and two open ears waiting for you. Having a friend that is a fitness buff means you will always have someone to motivate you to get your bum to the gym, even on the days when you really don’t want to. Plus, you always have someone who is more than willing to help you lose those extra few kilos of baby weight. And she won’t make fun of your choice in Lycra leggings. Got a friend that has kids just a couple of years older than yours? Not only will she most likely be happy to pawn her boxes of old baby clothes off on you, but she will also have some great advice to hand over. And whenever you’re feeling like it’s all too much, you can be sure that hand-me-down mum will be right beside you, nodding in agreement at your desire to run away. Why is the I-don’t-care mum so awesome to have by your side? Because she is so nonchalant that all your own stresses seem to melt away. Kids ate two-minute-noodles for dinner again? The I-don’t-care mum doesn’t judge. Her kids ate the same thing last night. If the kids are alive, then you’re doing a great job in her books. Having a friend who adores your children almost as much as you do not only helps you appreciate how awesome your kids are, but it also means you have someone who is more than willing to watch them if you get stuck late at work or if you are too sick to get out of bed. Honorary-Auntie will be over in a heartbeat. And she often brings gifts for her favourite nieces and nephews. We all need that one friend that will be there no matter what – to share your tears when you’ve lost your job, to share your clothes when she has an important event to attend, to share a bottle of wine when you’ve had a bad day. Sure, you may already have another half officially, but she is the real other half of you. And she is irreplaceable. How many of these mummy friends do you have in your life and which one are you? Do you agree that being a mum would be a lot less fun without them?